There is an old saying that comes from Jewish Vilna, "go to Lodz for money, and come to Vilna for wisdom. "2 A man from my father's hometown of Hrubieszow, Poland, a small stetl located near the major city of Lublin recently said to me, "Vilna was the most famous city in Poland. It was an honor to say you were from there. "3 Vilna at its very height had a rich Jewish cultural life with vibrant institutes of higher learning. Prior to the Nazis' invasion of Vilna, the city was known as the "Jerusalem of the North." At the time of Vilna's liberation in July 1944 the majority of Vilna's Jews had been shot and killed at the pits of Ponary by the Nazis and local Lithuanian collaborators.4 Close to half of the Jewish population of Vilna had already been murdered before the sealed ghetto was even created in September of 1941.5 Once the Nazis implemented their program for the Final Solution of the Jewish question in Europe, the Jews of Vilna were amongst the first in line to be destroyed. The Nazi invasion also ignited the seizure of Jewish homes owned for generations, their personal possessions, and family heirlooms and implemented a quota to destroy seventy percent of all the Jewish books housed in the city--thus attempting the full destruction of the history, identity and memory of Vilna's Jews.6 The Jews of Vilna found themselves completely surrounded in an environment with both Nazis and hostile locals, and were doomed. However, the hopelessness and defenselessness of Vilna's Jews does not imply they willingly succumbed to their destinies. Contrary to the modern day vision of passivity, was resistance on various levels--all of equal importance. There was spiritual resistance with the creation of theater, music, and continuing education within the ghetto; there was the 'paper brigade' that helped save what became the remnants of Vilna's books; and there were young leaders who helped organize a unified movement of resistance in the Vilna ghetto. Discussed here will be numerous aspects of resistance; however the main focus is on the various political groups of youth and young adults that secretly met within the newly created ghetto and began to arm themselves and discuss ways to fight back against their oppressors. In trying to flesh out the facts about the Holocaust perpetrated in Vilna and the losses incurred that provoked a resistance movement, there first needs to be an understanding of what the city of Vilna was, before the Nazis invaded. Readers of the Holocaust, often ask themselves how such a tragedy of this magnitude happened? Somewhere within early Lithuanian and Polish history lies the answer. The following is a guide to the Jewish communities' over five hundred years existence in Vilna, a city and a community of people that has been erased from many world history and geography text books--a city and community no longer to be found. Some today, including myself, still refer to the city as Vilna even though the name was changed during WWII. My mother was raised under Polish rule when the city was called Wilno. However, when my mother and father left the city after liberation in 1944, the Lithuanians had renamed the city Vilnius, a name that was kept in place by the new Soviet occupiers. As a second generation of Holocaust survivors my mother often referred to the Polish name Wilno, but more often in my family the city was referred to as Wilna, or its English version Vilna since that was the name my mother's family had used for generations including my three great uncles who fled czarist Russia to America between the years 1905 and 1910. For the purpose of this historical guide, the city will be referred to as Vilna. In 1322, Lithuanian Grand Duke Gedimin built a fortress castle on a foundation attributable to the Normans dating back to the tenth century. Throughout Vilna's early history were restrictions placed upon Jews created by the ruling elite of both Church and State. However, these restrictions placed upon the Lithuanian Jews were minor in comparison to the restrictions placed on Polish Jews.12 The Polish middle class had been influenced by the clergy's anti-Jewish teachings and the Polish King's trade limitations placed on Jews and other kinds of restrictions, such as having to wear a yellow hat.13 The Union of Lublin in 1569 formally united the Crown of the Polish Kingdom and the Grand Duchy of Lithuania--Polonizing Lithuania through an integrated language and culture. Although, the two states of the Commonwealth were considered equal, Poland was the dominate partner in the united state. The Roman-Catholic Church significantly influenced the Commonwealth. The union between Poland and Lithuania was achieved by Sigismund II Augustus, the last king of the Jagiello Dynasty. His death ended the nearly two hundred year hereditary monarchy. The subsequent monarchy was elected by the nobles, and no longer had power over the military, financial, administrative and political affairs of the State. The Jewish minority became subjected to the hostilities of the Catholic Church and the nobles; and the middle class Christian tradesmen and craftsmen looked at the Jews as competition.14 By 1573, an organized Jewish community in Vilna had built their first synagogue and called it the City Synagogue. By 1592 the city had a street called Jews' Street. The middle class tradesmen simmered with resentment towards the Jews of Vilna and attacked the synagogue and the shops on Jews' Street on May of 1592. The Lithuanian Supreme Tribunal ruled that the culprits pay the Jews for damages and spend six weeks in prison. The tradesmen ignored the ruling, however one year later agreed on a settlement. After several more attacks by the tradesmen, King Sigismund III addressed an injunction in 1632 forbidding violence against Jews or interfering with their trade. The power of the Commonwealth uniting the two states first created in Lublin in 1569, entered a decline in 1648 for two reasons. First was the Cossack-Russian occupation, and second was the Swedish invasion in 1655. The later part of the seventeenth century was marked by increasing hostility on the part of the tradesmen towards the Jews in Lithuania and Poland. The hostilities were ignited by wars, and the aftermath of poverty, and anti-Jewish feelings fomented by the clerics who disseminated the story of an alleged blood libel case brought against the Jews in Vilna and Bialystok in the late fifteen hundreds.20 The clerics and Jesuit priests actively tried to get the Nobles to pass "special laws" against Jews. King John III Sobieski tried to bring tolerance and suppress the anti-Jewish riots, and sent troops when he heard there was a pogrom carried out by the tradesmen against Jews. The partitioning of Poland - Lithuania that divided large parcels of land between the three neighboring countries, mostly was absorbed by the Russian Empire. Within the parcel Russia annexed there was Vilna's Jewish population numbering between 5,000 to 6,000, who had been the target of intolerance by the Commonwealth's clergy, nobles and tradesmen. However, the czars of Russia were worse by far.30 At the time of the first partition of the Polish - Lithuanian federal state in 1791, Czar Catherine II (1762 - 1796) established the Pale of Settlement. Vilna, the "Jerusalem of Lithuania"
Head of the Jewish "Council of Four Lands"
However, there are other legends that have carried through the centuries. During the reign of Czar Alexander I, France captured the city of Vilna for a brief period from June 28, 1812 to July 16, 1812. Napoleon Bonaparte, along with his advancing army marched from the banks of the Nieman at Grodno and through the Rudnicki forest to invade Russia, and briefly settled in the city of Vilna on his way to Moscow. Upon his retreat, Napoleon re-entering the city of Vilna on November 23, 1812 saw the Great Synagogue, and has been reputed to exclaim, "Vilna, is the Jerusalem of Lithuania!" The Romm Printing Press was established in 1789, and was based in Vilna, with a second print shop in Grodno. Over generations the business grew and became the largest printing house, store and publishing business known to world Jewry. The Romm family distributed the largest body of rabbinical and scholarly work within the Yiddish-Hebrew world during this period--including the Talmud, Mishna, Bible and various other important secular texts.38 In 1893 Matthias Strashun, a Talmudic scholar, founded a large private library of Jewish literature with his fortune that was preserved under his name with 7,000 volumes bequeathed to the community. The Strashun collection became a part of a five story building named the Strashun Library that was located inside the courtyard of the Great Synagogue. At the close of the century, the Jewish community of Vilna had grown to nearly 63,000, forming forty percent of the city's total population. As a minority group, the Jews of Vilna became more politically minded in trying to establish trade, work, and property rights. The Jewish Labor Bund and the Hoveve-Zion societies, forerunners of Zionism, were established. In addition to the various yeshivas that sprang up were modern secondary and higher institutes of learning that focused on the instruction of Yiddish and Hebrew languages. Such institutes of study inspired a list of prominent scholars, writers, and poets. 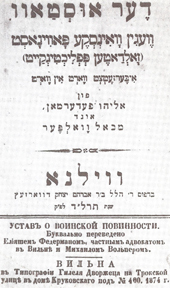 The writers group Young Vilna included such names as: Max Weinreich, Zalmen Reyzen, Max Erik, Moyshe Kulbak, Chaim Grade, and Abraham Sutskever.39 By the nineteenth century Vilna was a hub of Jewish culture, with Yiddish newspapers, publishing firms, and printing presses. 1. Dawidowicz, From that Place and Time, xiii. 3. Josef Mermelstein, Michael Bart's friend's father who lived in the same hometown as his father, told him in a phone conversation on Oct. 2007. 4. It is estimated that 94 percent of Lithuanian Jewry was murdered during the Nazi occupation. In 1958, the Einsatzkommando trial in the Soviet Union documented the Nazi's genocidal actions--nearly 207,000 out of 220,000 Lithuanian Jews were murdered. Harran, Marilyn The Holocaust Chronicle: A History in words and Pictures, 246, 259, 671; Lithuanian collaborators: "snatchers" and "riflemen." Kruk, The Last Days of the Jerusalem of Lithuania: Chronicles from the Vilna Ghetto, 60. Kruk writes in his diary: "the snatching of organized groups who were intended to work for the Germans has become a daily event...The Germans respond that they don't know anything about the matter, and the Lithuanians respond that they have orders...Meanwhile the Jews fall victim;" Kruk, 224. Kruk writes in his diary: "A Living message from Ponar...In front of the grave stood six Lithuanian soldiers with rifles. The victims stood in rows of six, and as soon as a row was arranged, a Lithuanian gave an order, there was a salvo, and six people fell into the grave. Another row of six was driven up, again shots...and so on;" Sakowicz, ED. Yitzhak Arad, Ponary Diary (1941 - 1943) A Bystander's Account of a Mass Murder: This diary is written by a Polish man that lived in a cottage above the extermination site at Ponary. From his home he was able to view the daily shootings carried out by Lithuanians who manned the firing squad at Ponary. Refer to the diary's index: Lithuanian collaborators; For German documents on the Wannsee conference regarding Lithuanian collaboration: go to http://fcit.usf.edu/holocaust/resource/document/DocJager.htm -- The German documents state: "Security police duties in Lithuania taken over by Einsatzkommando 3 on 2 July 1941. The Wilna [Vilnius] area was taken over by EK 3 on 9 Aug. 1941...Up until these dates EK 9 operated in Wilna... Following the formation of a raiding squad under the command of SS-Obersturmfuhrer Hamman and 8-10 reliable men from the Einsatzkommando, the following actions were conducted in cooperation with Lithuanian partisans: EK 3 detachment in Wilna: 12.8-1.9.41 City of Wilna 425 Jews, 19 Jewesses, 8 Comm. (m.), 9 Comm. (f.) 461 2.9.41 City of Wilna 864 Jews, 2,019 Jewesses, 817 Jewish children (sonderaktion because German soldiers shot at by Jews) 3,700 12.9.41 City of Wilna 993 Jews, 1,670 Jewesses, 771 Jewish children 3,334 17.9.41 City of Wilna 337 Jews, 687 Jewesses, 247 Jewish children and 4 Lith. Comm. 1,271 4.10.41 City of Wilna 432 Jews, 1,115 Jewesses, 436 Jewish children 1,983 16.10.41 City of Wilna 382 Jews, 507 Jewesses, 257 Jewish children 1,146 21.10.41 City of Wilna 718 Jews, 1,063 Jewesses, 586 Jewish children 2,367 25.10.41 City of Wilna 1,776 Jewesses, 812 Jewish children 2,578 27.10.41 City of Wilna 946 Jews, 184 Jewesess, 73 Jewish children 1,203 30.10.41 City of Wilna 382 Jews, 789 Jewesses, 362 Jewish children 1,553 6.11.41 City of Wilna 340 Jews, 749 Jewesses, 252 Jewish children 1,341 19.11.41 City of Wilna 76 Jews, 77 Jewesses, 18 Jewish children 171 19.11.41 City of Wilna 6 POW's, 8 Poles 14 20.11.41 City of Wilna 3 POW's 3 25.11.41 City of Wilna 9 Jews, 46 Jewesses, 8 Jewish children, 1 Pole for possession of arms and other military equipment 64 ...Today I can confirm that our objective, to solve the Jewish problem for Lithuania, has been achieved by EK 3. In Lithuania there are no more Jews, apart from Jewish workers and their families...(signed) Jager SS-Standartenfyhrer"
5. Arad, Ghetto in Flames, 215. 6. Fishman, Embers Plucked From the Fire., 7. 7. Cohen, Vilna, 10. Israel Cohen writes in his Preface that his book published in 1943, as far as he was aware, was 'the first comprehensive history, in any language, of the Jewish community of Vilna from its earliest times.' Ironically, Cohen wrote about the history of the Jews in Vilna during the destruction of Vilna's Jewry (1941 - 1944). His information in large part is based on the books and brochures that he acquired with the help of a scholarly librarian at the Strashun Library while visiting the city fifteen years prior. In regards to the city's name Cohen writes, prior to WWI the Russian spelling Wilna was 'fairly universal', when the Poles controlled the city the name was Wilno. During the brief occupation by the Lithuanians it was Vilnius, and under German authority the spelling was again Wilna. But 'the pronunciation in English speaking countries has always been Vilna, and that too is the pronunciation in Jewish circles'. 8. Cohen, Vilna, 2, 3, 6; Dawidowicz, From that Place and Time, 33 - 34. 10. Ibid., 6 - 7. 11. Ibid., 8 - 9. 14. Cohen, Vilna, 11 - 12; Levin, The Litvaks: A Short History of the Jews in Lithuania, 48 - 49. 15. Cohen, Vilna, 24 - 28, 30, 91, 103. 17. Cohen, Vilna, 44; Beitler Family Foundation, The Timechart History of Jewish Civilization, 8. 18. Cohen, Vilna, 47 - 49. 20. Beitler Family Foundation, 8: The first blood libel case took place in Norwich, England in 1144; Cohen 54: The first case of "ritual murder" in Lithuania was in 1680. Due to religious fanaticism within the local population, a family and five of the Jewish community leaders were condemned to death with an allegation of "ritual-murder" handed down by the Vilna Tribunal and again ten years later three more Jews were charged and convicted of "ritual-murder" in Vilna and Bialystok. 22. Ibid., 56 - 57. 23. Ibid., 58 - 59. 26. Cohen, Vilna, 84; Encyclopedia of the Romantic Era, 1760 - 1850, 586. 27. Kostanian, Jewish Life in Lithuania, 39. 28. Dawidowicz From that Place and Time, 30. 29. Cohen, Vilna, 86 - 87, 282; Ran, Jerusalem of Lithuania, XIX; Dawidowicz From that Place and Time, 30. 30. Ran, vol 1, Jerusalem of Lithuania, XIX; Gutman, The Encyclopedia of the Holocaust, 895 - 896. 31. "Pale of Settlement, Jewish." Britannica Student Encyclopedia, Online. 2 Feb.
32. Cohen, Vilna, 266 - 267, 270 - 271, 274 - 275. 35. Kowalski, A Secret Press in Nazi Europe, 25. 36. Ibid., 25 - 27. 37. Cohen, Vilna, 223, 263; Dawidowicz, From that Place and Time, 33, 43 - 45. 38. Cohen, Vilna, 328 - 330, 223.